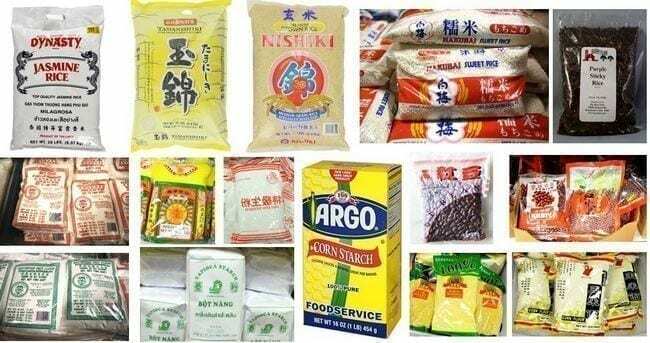 Chinese white rice is usually a medium to long grain variety, but there are many levels of quality and different types. Don’t even think about touching that par-boiled stuff–you definitely won’t see many Asians eating par boiled rice unless there are no alternatives. Long grain rice has a long kernel, but it’s not quite as long as Basmati rice. It is almost always what you get from your local Chinese restaurant. When cooked, the grains should be relatively separate, light, and fluffy–perfect for making a batch of fried rice! 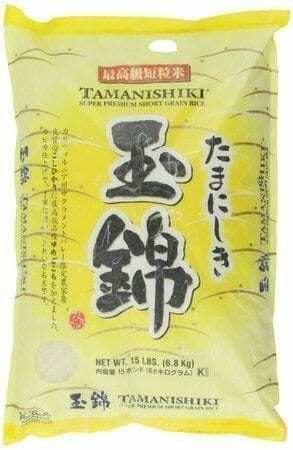 Jasmine scented rice is a high quality type of long grain rice that usually comes from Thailand. 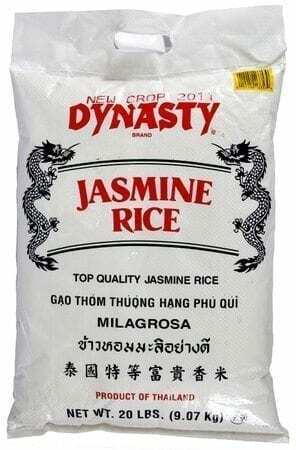 Jasmine rice has a wonderful aroma that smells a little like popcorn when it is cooking. The individual grains have a nice sheen to them when cooked properly, and the texture and flavor is unequivocally luxurious. This is our favorite type of rice and we always give bonus points to restaurants that serve it. Short grain rice has a short (just like the name) and oval shaped kernel. 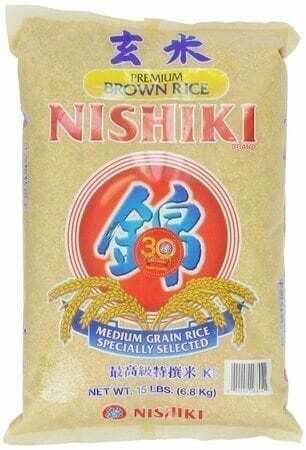 Most people know medium to short grain rices from Japanese sushi or arborio rice, which is used to make risotto or rice pudding. When cooked, these grains are soft and clump together more so than long grain rice but not as much as sticky rice. One of our favorite and simplest ways to eat short grain rice is folded inside a piece of salty roasted seaweed. Perfect lazy food! Chinese black rice is becoming more popular but is still nowhere near as commonly found as your run of the mill white rices. We use black rice in a multi-grain porridge when we feel like being healthy, but we included it here to remind us that it is high in antioxidants and we should use it more in our daily meals and our recipes! 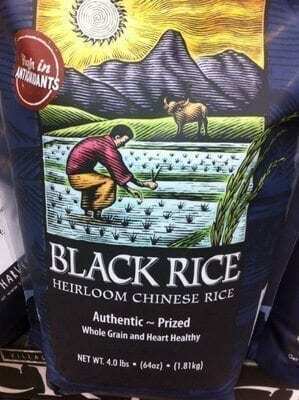 Black sticky rice is used in quite a bit in Asian desserts. Cooked with an ample amount of water and cooled, the sticky rice is quite soft and wonderfully glutinous. Dolloped in the center of some fresh fruit, sweet milk and shaved ice, it’s amazingly good. We use Thai black sticky rice in our Honeymoon Dessert Copycat recipe, but we still miss having the real Honeymoon Dessert confections on hot summer nights in Beijing. Brown rice has become more popular over the last five to ten years among health conscious consumers. 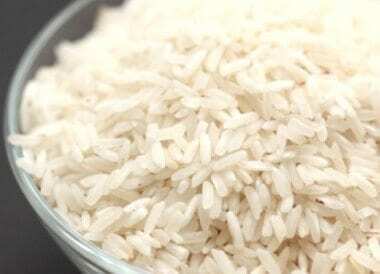 In general, brown rice undergoes less processing and retains part of the rice bran, making the rice a bit chewier. It also takes longer to cook and requires slightly more water than your regular long-grain white rice. It’s also higher in fiber–always a bonus! If you’re looking for that extra health kick, you can sub in brown rice for white rice in the majority of our recipes that use white rice. Also known as sticky rice or sweet rice, glutinous rice is made from short-grain rice kernels. 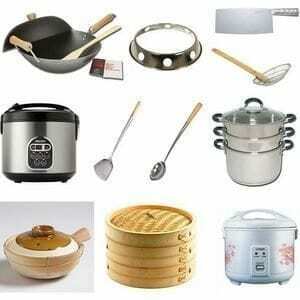 In Chinese cooking it’s used in savory dishes as well as desserts and sweets. We LOVE sticky rice, and we have the recipes to prove it! Just check out some of our favorite recipes including Roasted Chicken with Sticky Rice and Roast Chicken on Wild Mushroom Sticky Rice “Risotto”. 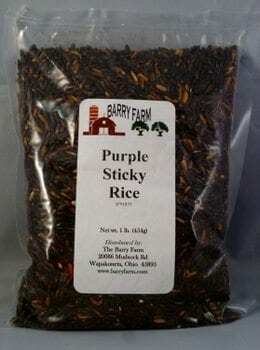 Just search for sticky rice on the side bar, and you’ll find other recipe gems! 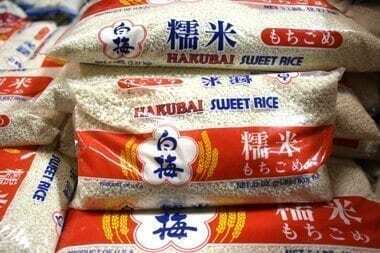 We have used many brands, including the Hakubai sweet rice pictured below. 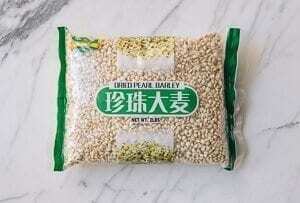 Chinese pearl Barley is also known as Job’s tears and is native to East Asia. 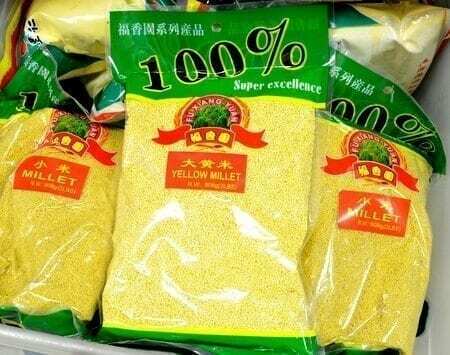 Pearl Barley is generally used in Chinese soups and can be fund in most well stocked Asian stores. 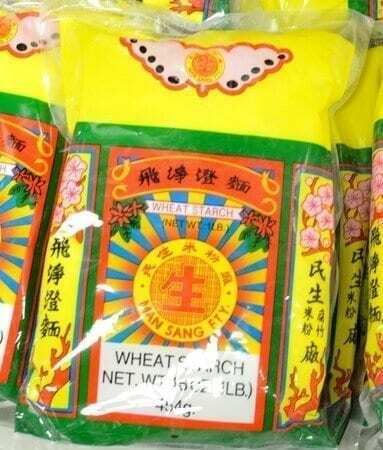 This is a flour made from ground long grain rice. 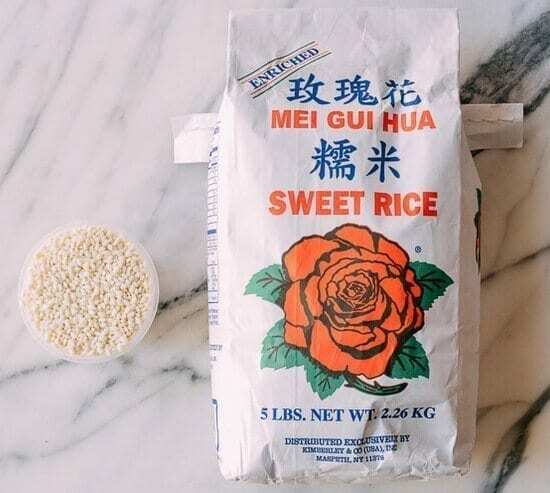 Not to be confused with glutinous rice flour as they have different uses; confusing these two flours can result in some unfortunate recipe errors in the kitchen (trust us, we’ve been there)! 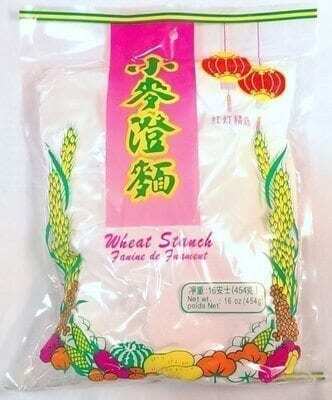 Rice flour is essential for recipes like Turnip Cake (Lo Bak Go), Taro Cake (Wu Tao Gou), and Sticky Rice Hashbrowns (Ci Fan Gao/粢饭糕). 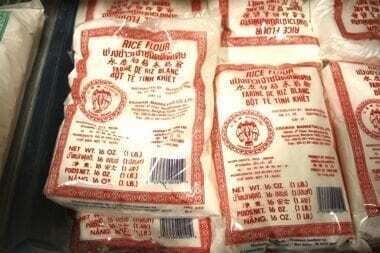 We found our favorite brand of rice flour on Amazon, but it is a bit pricey, so it’s best to buy it locally at your Asian store if there’s one near you. Most know about glutinous, sweet, or sticky rice, which all refer to the same type of rice. but what about flour made from sweet rice? It’s a key ingredient in many dim sum dishes and desserts, but so far we don’t have many recipes that call for it. Sesame balls anyone? How about a good Nian Gao recipe for the Chinese New year? We’re working on these recipes, and we’ll update this page accordingly! 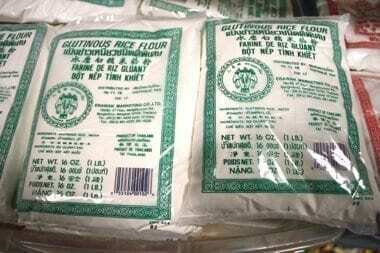 Again, we found our favorite brand of glutinous rice flour on Amazon, but it is a bit pricey, so it’s best to buy it locally at your Asian store if there’s one near you. And we also found this brand on Amazon. 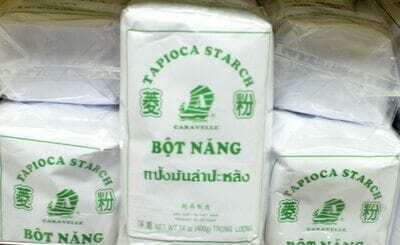 Tapioca starch is used for making rice noodles and dumpling skins, but, like corn starch, it is also a thickening agent. It’s consistency when mixed with water is, well, a little bit gooey for lack of a better term. 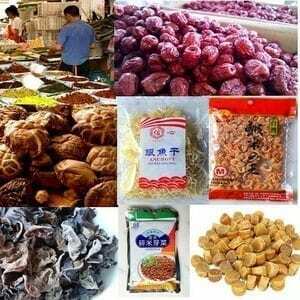 This is what makes it a key ingredient for applications like steamed rice dumplings and Cheung Fun rice noodles. It makes the finished product softer and silkier in texture. No lumpy cheung fun here! 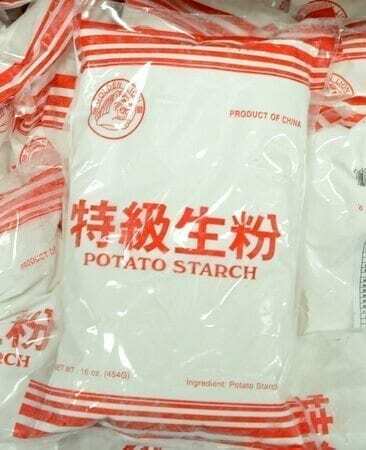 Corn starch is used extensively for thickening in many Chinese stir-fries and dishes with lots of gravy and almost always mixed with water into a slurry before it is used. 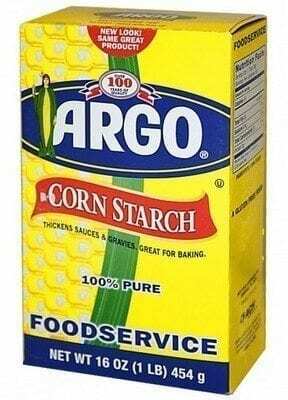 If you always wonder how Chinese takeout restaurants get those luscious silky thick sauces, it’s all thanks to humble corn starch. It’s available everywhere and quite inexpensive! 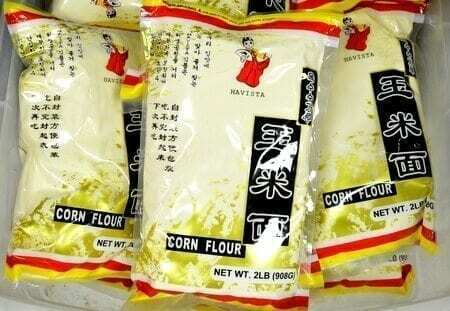 We posted this corn flour because we want to make the point that it is different from corn starch and should not be substituted for corn starch. Corn flour is a finely ground corn meal, and, while we don’t use it much, it is good as a coating for certain fried foods. One other point while we’re on the subject is that masa harina is also different from corn flour, so don’t try to make your homemade tortillas with corn flour either. Bottom line, corn starch, corn flour, and masa are all different ingredients made from different types of corn using different processes. So be sure to follow the ingredient lists in any recipe that calls for corn-something carefully! The good news? You’ll be using the most easy-to-find ingredient, corn starch in the majority of our recipes! 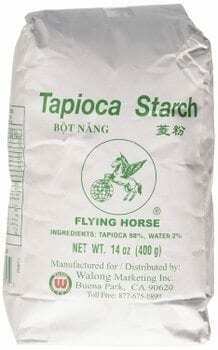 More similar to tapioca starch which also is a root vegetable starch. Some cooks say that potato starch makes things a bit more crispy for frying. But we’ve found that the difference is pretty small when it comes to frying, so you can substitute corn starch unless the recipe is specific about the role of potato starch. 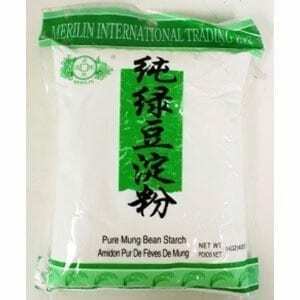 Mung bean starch is commonly used in Asian cuisine. 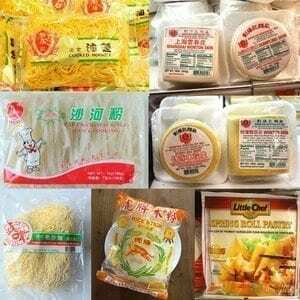 Mung bean starch is also used to make bean thread noodles, also called cellophane or glass noodles and mung bean jelly or liang fen. 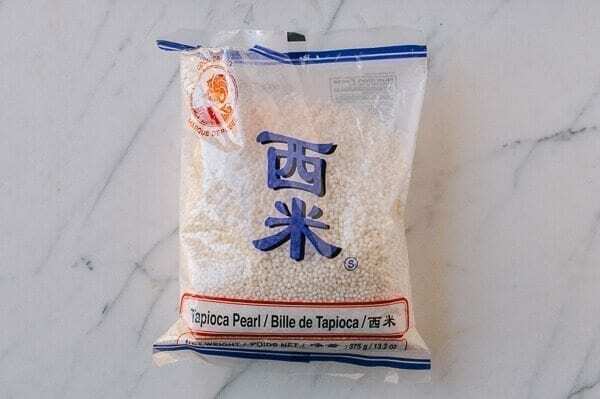 Small Pearl Tapioca is used to make traditional old-fashioned tapioca pudding, but it is also used in many Chinese sweet warm desserts. 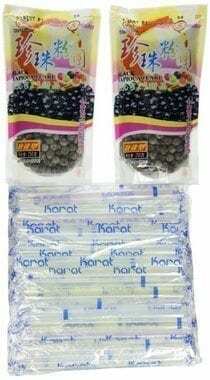 They can be found in your local Asian grocery stores like the package below. You can always find them in western grocery stores or on Amazon. 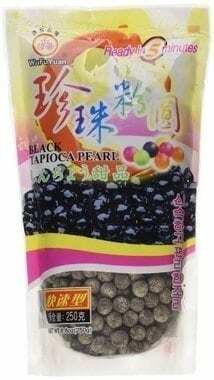 Then there are the black tapioca pearls for making bubble tea, also known as Boba. This drink is becoming more common and readily available in areas with a larger Chinese population and neighborhoods like Flushing, NY. We have a very traditional Bubble tea recipe courtesy of Kaitlin that is simple to make and spot-on for the most classic Bubble Tea made with black tapioca pearls and black tea and milk so follow the link above and give it a try! Tapioca Pearl (Black) – Net Wt. 8.8 Oz. The link below is for a double pack with a set of large straw if you ever decide to hold a party! 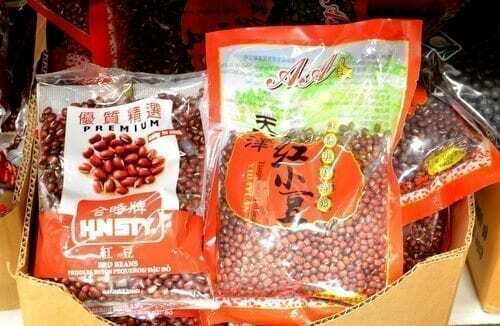 Cooked red beans and red bean paste should be available at your local Asian grocery store if you’re lucky enough to have one nearby. Depending on your preference and the dish you are cooking, you may prefer one over the other. It’s kinda like choosing between crunchy or smooth peanut butter. Also, the smooth variety usually has far more oil and sugar added than the whole bean variety. Dried red beans give you the ultimate choice of how you want to prepare them. Like any other dried beans, they have to be soaked, usually overnight, and cooked thoroughly until tender. 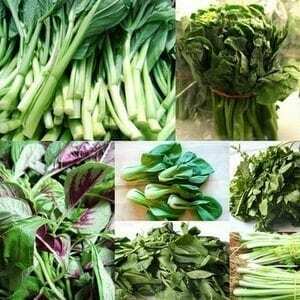 They can be used in soups but are more often found in Asian desserts and baked goods. We found these organic red beans on Amazon–again, another good item to buy in store if you can! 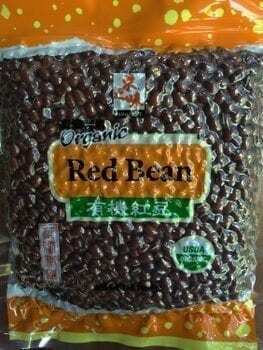 Organic Azuki Red Beans – 16oz. We sometimes mix millet with our rice for a change of pace and an added health boost. It’s a tasty and easy way to get more grains in your diet. Sometimes we sneak these additions into our blog post photos like our Chicken with Garlic Sauce feature photo! Mung beans are perhaps best known in the Asian world for their sprouts. Did you know all of those deliciously refreshing bean sprouts that you eat in your lo mein or in your fried rice are actually mung bean sprouts? Yep, that’s right. Mung beans are actually more commonly consumed by Chinese as whole beans in soups, congees, desserts, and yes, Mung Bean Popsicle sticks! 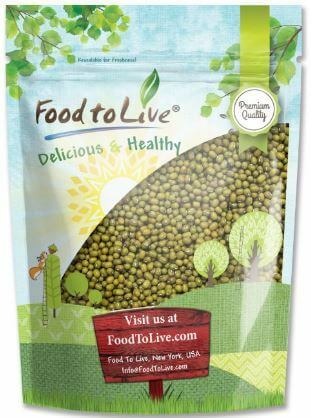 Eating mung beans can cool you from the inside out, according to traditional Chinese medicine and it is a very popular summer snack in whatever forms they are consumed. Check out the link below for more information on where to purchase them or just go on over to your local Asian grocery store. 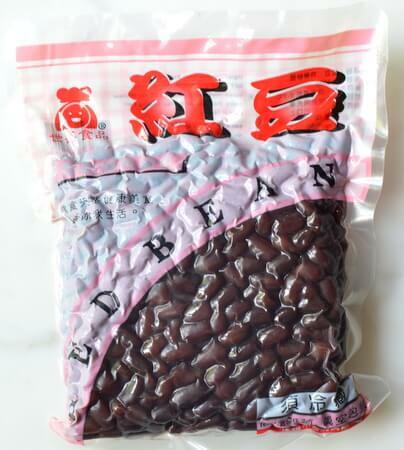 can i use American red beans to make red bean bread if I cant get to Asian market ? Hi Carm, I’m not sure you can use a bean other than the Asian adzuki red bean, since we have not tried it. Please do let us know if you do try it, what kind of bean you use and how it turns out! This is a great, really helpful, website! 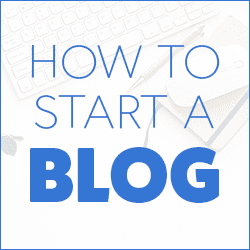 I am a big fan of your blog. Was just reading the recipe for Spicy Rice Cake Stir-fry and realized I have never seen or eaten that type of rice cake. I only know about the big round ones made by American manufacturers for snacks. Went to your ingredient glossary and did not see an entry. So I looked for something similar on the internet. I saw several brands, one identified as “rice ovalettes”. Apparently the cakes come fresh or dried. Is this what you used? If not do you have a recommendation? I know these are not available in local grocery store so I’ll make a trip to big Asian store to buy; want to get the right thing. 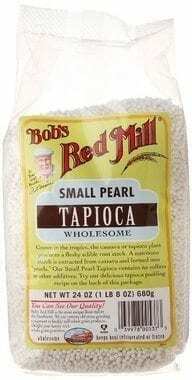 On your Tapioca Pearls that brand on the picture also has colorful Pearls which I have. I think with these Pearls they soak them in powders of different flavors. I seen the flavors which is kind of cool .I know a Chef who’s wife makes her own Pearls and Boba drinks. She runs a little place and sells them her husband runs a restaurant and makes yummy food .